Perfect as gift container for little crafty gifts for a fellow crafter or as container in a studio. And when the tea is long gone and the gift card spent, the mug and tray still do duty in a craft room to hold crayons and bits and bobs! 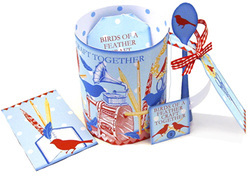 Vintage Craft Equipment and Crafty Birds on this pretty 3D Mug, Spoon, Tray and Packet set.